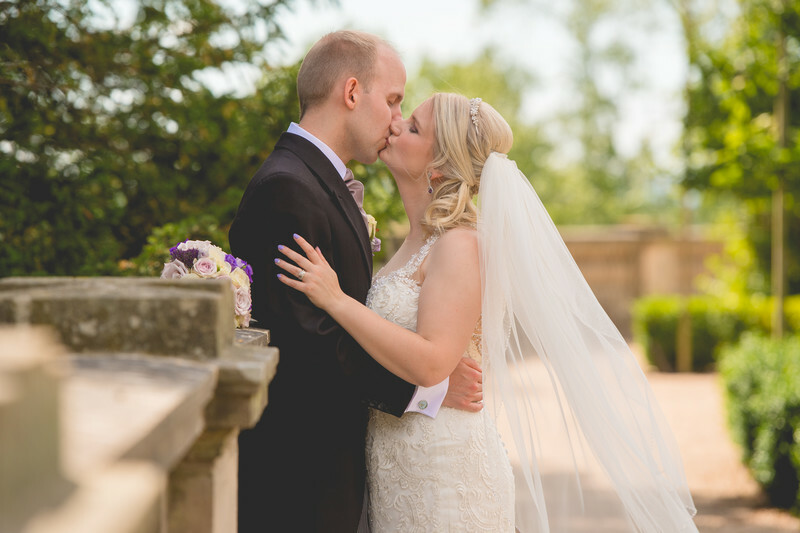 David and Laura got married at Fladbury Church near Evesham and held their wedding reception at the Wood Norton Hotel. The bride and groom had been hoping for a bright and sunny wedding day, which is exactly what they got - the only problem being that in the sun it was incredibly hot! David was wearing a full morning suit with waistcoat too, and I was conscious of cooking him in the hot sun! Another potential issue with direct sunlight when one person is wearing black and the other white, is the amount of contrast that the direct sunlight generates. Black absorbs the light, whilst the white reflects it. The camera sees light and this contrast very different to the human eye in that it doesn't deal with it well at all. So, in order to prevent cooking of the groom, and to deal with the extra contrast, I moved the bride and groom as soon as I could to an area of open shade. It was about 10 degrees cooler in the shade, and photographing in open shade gives perfect results and the light is warm and very soft. Along the perimeter of the garden at the Wood Norton Hotel is a wall that's about 3-4 feet tall, and works excellently as a feature to include in wedding photos. For this image, I had David lean against the wall with open arms in order to embrace Laura. I stood back and shot with a long lens in order that I could focus in on the newly married couple and render the background as out of focus as I could. I shot along the wall so I could use it to lead the viewer into the image. I am one of three Wood Norton recommended wedding photographers.